Evening Loverlies! I have received yet another loverly book from Bethany House to do a blog review on. 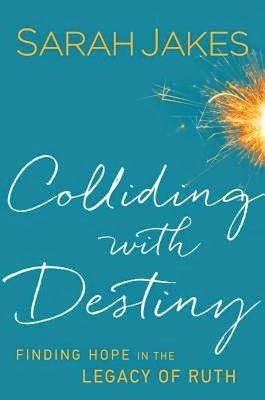 This book is called Colliding With Destiny Finding Hope In The Legacy Of Ruth by Sarah Jakes. I have to say I really enjoyed this book, I started Sunday morning and finished around noon. It was so interesting I just couldn't put it down! lol I also had my Bible out reading the scriptures that Jakes posted for each chapter. I had my Bible out to reread the scriptures she posted because I like to stick to the KJV. My opinion a lot of the other versions of the Bible either change or Omit words, which I am not fond of. Sadly I've never fully read Ruth on my own time, but this book got me doing just that. Which I am fine with, because I enjoyed reading this book as it reintroduced me to the story of Ruth. I also think this book could easily be used in a bible study on Ruth. The author includes a story in her life to go with each verse that is at the beginning of each chapter, which I found interesting. I think if you give this book a chance you will enjoy it as much as I have. Have A Blessed Day! The story of Ruth is a journey of transformation. By allowing God to transform her circumstances, Ruth went from a widow who would be excluded from society to a wife with a secure and protected future, a future that ultimately paved the way for the birth of King David! Her story is full of collision--loss, heartache, poverty, even shame--but she never let her past define her. Instead, the most painful time of her life became her most pivotal, propelling her to a destiny she'd never imagined. Perhaps you have a past you're struggling to overcome. If disappointments, whether a result of your own choices or the actions of others, have kept you from being your true self, this book is for you. Follow Ruth's life and discover the hope available to each of us. Your yesterday does not have to dictate your tomorrow.